Dental health is important for animals just like it is for people – be sure to get Buster’s teeth looked at regularly and check out the American Veterinary Medical Association’s website for important tips and a quiz to test how much you know about pet dental health! You can also make your own toothpaste with this simple recipe! Use a regular toothbrush or wrap your pointer finger in gauze and brush your dog’s teeth in a circular motion, aiming at the areas with the most plaque, and calmly talking them through the process. Rinse off any excess toothpaste in their water dish and enjoy that healthy pearly white smile! Pets add so much joy to our lives and we want to reciprocate this unconditional love, however, daily responsibilities like work and school often mean that we can’t spend as much time with Buster as we’d like. It’s hard to come home tired after a long day and work up the energy to take your energetic pup out for the exercise they need. Don’t sweat it – we’re here to support pet lovers so no one needs to forego pet parenthood because of work, family, travel or educational pursuits. One of the most important ways we support pet lovers is with daily dog walks, which help reduce stress for both you and your pup; you don’t worry when you’re home late and Buster doesn’t become anxious, depressed, or unhealthy. With diabetes and obesity becoming increasingly common among dogs, daily exercise is a great preventative approach to keeping Buster healthy, happy, and agile for years to come. The amount of exercise needed varies by breed between 30 minutes to two hours per day and vets agree that regular walks promote digestive health, keep aging dogs limber, relieve joint pain, maintain a healthy weight and reduce the risk of heart disease, high-blood pressure and diabetes. Walks also support emotional well-being, maintain routine and reduce stress, anxiety, depression, and other emotional and behavioral issues by allowing your pet to get exercise, explore, and enjoy company and love during the day. Dogs build up a lot of restless energy during the day and often have a hard time finding productive, nondestructive ways to keep themselves entertained. Release that energy in a healthy way by going on a midday walk instead of turning to shoes or couch cushions for entertainment. In addition to being a great form of exercise, walking can be an exciting part of your dog’s day. Daily walks help with socialization, allowing pups to explore new scents and sights in addition to meeting other dogs and humans. Walks are also a great way to practice walking on a leash and reinforcing training, reducing aggression and anxiety in the future. 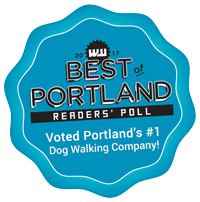 Whether your 15-year old bulldog wants a slow 30-minute saunter around the neighborhood or your Shepherd puppy needs a two-hour forest pack hike to be worn out, our award-winning team is here to help you create the perfect walking experience for your family. Get in touch to schedule weekly walks or talk to our admin team about your favorite four-legged walker or hiker. Last year, Hot Diggity! introduced an exciting new offering to all our clients; Forest Pack Hikes! This isn’t a normal potty break or breath of fresh air, this is a full-on socialization and sensory-rich adventure for your pups. When Pack Club dogs realize that it’s a Hike Day, they get as excited as if they’re going to Doggie Disneyland. All dogs go through an initial consultation where we determine if they’re ready for Pack Club and if so, which personality pack they fit best. Dogs must go through this approval process to make sure that everyone has a great time on the hike and that the pups who are more interested in the smells at every corner don’t slow down the speedsters who want to crack their previous distance record. On the hikes with our trained Pack Hike Leaders, the dogs get to explore a variety of trails depending on the day, and always on-leash. Each trail offers its different scents, sounds, and sights. This increased stimulation is beneficial for your dog’s mental and physical well-being. Instead of seeing the same things day after day at the route near your home, dogs on hikes get to explore a treasury of experiences that a forest has to offer. Over here are deer smells! Over there is an owl hooting! There are so many rocks and plants to sniff! Currently, we have morning (7-noon) and afternoon (12-5) pack hikes three days a week, Tuesdays, Wednesdays, and Thursdays. This means that while you’re stuck at the office, your dog is having the time of their life roaming the forest with a pack of friends. You might not be able to enjoy the sunshine and fresh air from your desk, but your dog will be savoring that fresh forest oxygen and can tell you all about it after work. This is the only service we offer where we take multiple dogs from different families out at one time (unless you’ve signed up for Buddy Walks with a friend). Each pack has a maximum of six members, but the number will vary between packs and days. Normally we love offering specialized individual attention, but spending time with other canines is beneficial, too. Without regular socialization, dogs can become shy and reactive towards others of their own kind. This behavior often leads to further isolation from other dogs, and further behavioral problems that will then have to be addressed by a professional dog trainer. With Pack Club your dog(s) can enjoy the companionship of other pups well-suited to their personalities. While on their adventure, good behavior is rewarded through positive reinforcement training by our Pack Leaders. We require that dogs be up to date on their vaccinations and on their flea and tick prevention. They need to have a normal, non-extendable, leash and tags on their collars with accurate information. Even though our Pack Hike Leaders are extremely responsible and excellent pet caretakers, we just want to be prepared as best as we can and for your dog to be as protected as they can. When the fun hike is said and done and everyone is all tuckered out from the great exercise and sensory experiences, our Pack Leaders give your dogs a towel wipe-down, check them for any little pesky passengers that may have tried to hitch a ride, make sure everyone is hydrated, and then load the gang up and take everyone home where they’ll probably be sleeping and dreaming of the fun they had on their hike until you come back home from work. If you want to apply to get your pup accepted into Pack Club, just email us with your interest or give us a call! We still have a few spaces available and would love for your pup to join in on the fun. In the Pacific Northwest there are many natural diseases hiding under rocks, in fields, or in puddles, waiting to get past our pets’ immune systems. However there’s one disease that we’re very fortunate to rarely ever encounter: Valley Fever. This special disease, caused by a fungus known as Coccidiodes immitis, is found in desert regions such as the American Southwest region including California, Arizona, Nevada, Texas, and more. While dogs and other pets living in the Pacific Northwest might not encounter the fungi here, many dogs are moved from high kill shelters in the Southwest to loving homes in the PNW, and sometimes those dogs have Valley Fever. One such dog is a young Mr. Johnny Cash. Cash is a very sweet little white shadow of an Aussie who loves to be next to his person and is available for adoption from Deaf Dogs of Oregon at the time of writing this blog post. Cash was rescued from a high-kill shelter in the Southwest and discovered to have Valley Fever. To understand what that means for dogs like Cash, read on! As mentioned before, this disease is caused by the fungus known as Coccidiodes immitis. 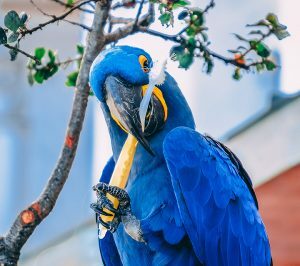 This pathogenic fungus can and does most commonly infect humans, but it also can infect a wide range of other animals including cats and dogs. Dogs are especially susceptible because they like to sniff and dig in the soil which is where C. immitis grows. During the dry season, C. immitis exits in a dormant mode in the soil and is not infectious, but after a wet-spell the fungus grows long filaments of mold with infectious spores on the ends. When these spores are inhaled into living organisms they create yeast-like infections in the lungs. No. Valley Fever cannot spread from organism to organism. While in yeast-like form (when it has infected a living organism) it does not create the spores which are the only infectious part of C. immitis. What does Valley Fever look like? In healthy dogs and cats, their immune system usually isolates the fungus and prevents them from causing symptoms of the disease. Many infected animals don’t show any signs at all. However in dogs with weakened immune systems, including very young puppies and older dogs, these infections will grow too large for the immune systems to handle and can cause visible symptoms of the disease and infect other organs. In the Primary Disease, the infection is limited to the lungs. About three weeks after infection symptoms such as a dry cough, fever, lack of appetite, and lethargy become apparent. In the Disseminated Disease, the infection spreads beyond the lungs and infects other organs including the brain, bones, heart, and eyes. Often it affects the bones and the symptoms will then progress to looking something like arthritis. Dogs suffering will show signs of lameness or limb swelling. Other symptoms of the Disseminated version of Valley Fever may include wounds that don’t heal*, swollen lymph nodes, back or neck pain, seizures, inflamed and/or cloudy eyes, abscesses under the skin, and even unexpected heart-failure. Sometimes a dog may show no symptoms of the Primary Disease before showing symptoms of the Disseminated Disease. Cash’s Valley Fever has infected his bones, but as he’s on regular antifungal medication the disease is not progressing further and is healing up. This does cause him to act like he has arthritis and be limited in movement, but this will go away when his infection does. How is Valley Fever diagnosed? In the Pacific Northwest, where Valley Fever is not native, you’ll need to let your veterinarian know the travel history of your new dog. If they then suspect that their symptoms come from Valley Fever, there are a few different blood tests that can be used to diagnose Valley Fever, along with x-rays of the chest or bones. How is Valley Fever treated? If your dog is sick enough to be seen by a veterinarian for Valley Fever, then the disease will likely need to be treated by extensive antifungal medications with courses usually lasting between 6 and 12 months. If the disease has progressed into the disseminated stage, then the treatment may be longer. The medication is easy to administer, it’s usually just provided orally in the form of pills or capsules twice a day. For dogs with bone or joint pain or coughing, other medications may be prescribed as well to relieve the suffering from these symptoms. If you have a dog with Valley Fever, you can still go on vacation no problem! Hot Diggity! Sitters know how to administer pet medications and will stick to your medication schedule to ensure your pet’s health while you’re away. 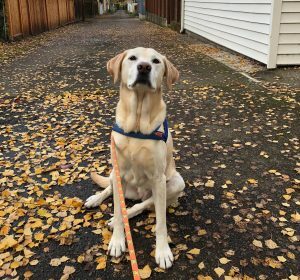 And to help out the new furever family of Cash, Deaf Dogs of Oregon is paying for a full year’s worth of medication (starting from when he moved up to Oregon, so about another 10 months left now)! So his new family won’t even have to worry about figuring out what medication to put him on or paying for it for several months and hopefully the majority of his treatment. What is the prognosis for a Valley Fever infection? With early detection and intervention, most dogs recover from Valley Fever. Even with the Disseminated Disease version of Valley Fever, more than 90% of dogs respond well to treatment and recover. Only a very small portion of dogs either need lifetime treatment or will die from the disease. Valley Fever is a highly treatable disease that is common in dogs rescued from Southwest shelters. Left undiagnosed and untreated, it can become severe and dangerous to the dog, but when treated there is a high success rate of clearing up the infection. It is not contagious to humans or other animals, just painful and unpleasant for the infected pet. With love and care, as all pets need anyways, almost all dogs recover from this disease to live the rest of their lives happily and healthily. So you can expect a lot of happy years with the lovely and sweet Mr. Johnny Cash if you adopt him! And as an added help, Hot Diggity! will provide any family that adopts Cash 3 Free 30-Minute Walks to help transition him to his new home as well as a lifetime 10% discount on all of our services for all pets in the family. To learn more about Cash, you can read about him here or just contact Deaf Dogs of Oregon and meet him yourself! Oh, and are you worried about adopting a deaf dog? Don’t! Does your hearing dog really listen to you anyways? Just kidding. 😉 But really, deaf dogs are just like normal dogs and especially since most of them are Australian Shepherds, extremely intelligent and highly trainable. Plus when you adopt through Deaf Dogs of Oregon they’ll have already undergone some training from being in foster care and you get a free training session with a specialized trainer too. The Humane Society for SW Washington holds an annual Walk/Run for the Animals usually in May. This is held in Downtown Vancouver and raises funds to support their adoption services. This year the event is May 5th, 2018. Oregon Humane Society holds an annual Doggie Dash event at the end of May to support finding homes for thousands of homeless pets. This is held in downtown Portland at the Tom McCall Waterfront Park. Doggie Dash will be held on May 12th, 2018. The Best Friends Society holds an annual Strut Your Mutt event in different cities all around the country including Portland in September. There’s lots of activities to do here even after you finish your run or walk and plenty of vendors to visit. DoveLewis holds an annual Westie Walk in August. Don’t have a cute Westie? Don’t worry! No matter their pedigree, all friends of Westies are welcome. The annual Corgi Walk in The Pearl is held in August. Every dollar raised goes to helping abandoned and abused Corgis find happy furever homes through the CRPWCC Corgi Rescue as well as to other pets through the Oregon Humane Society. Come out for a good time in late summer with the Family Dogs New Life Shelter’s annual Fun Walk and 5k Run. There’s a lot of fun vendors to meet there as well as great prizes in the raffle. Rose Haven isn’t an animal rescue, although they are pet friendly since they understand that the pets of the women and children they help are part of their families too. Instead, Rose Haven focuses on helping women and children going through abuse or other disruptive life challenges by providing them with a safe community and services to help them. Every Mother’s day weekend they hold their annual Reigning Roses Mother’s Day Walk which is fun and also dog friendly! The 2018 Reigning Roses Mother’s Day Walk will be held on May 13th. We hope you have fun throughout the year helping these great organizations and getting in some wonderful sunshine and fresh air with Buster. 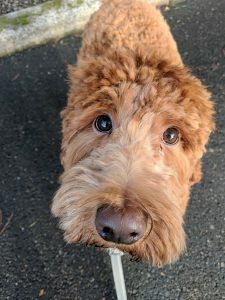 Know any other annual walks or runs in the Portland area that are dog friendly? Let us know! And to find more great organizations helping pets in the Portland area, check out our Community Partners page. While it might be difficult to get used to at first for either a new cat owner or a new cat, nail trimming is an important part of keeping your feline healthy. Without regular trimming, cat’s nails can actually grow long enough that they will curve into the cat’s paws. This is not only painful, it can lead to serious infections too. Thankfully, trimming your cat’s nails doesn’t have to be an H. P. Lovecraft horror fest with a few training tips and tricks. Start by training your cat to be comfortable with their paws being handled. While they’re relaxed from being pet, offer them treats while you handle their paws. Don’t continue if they become uncomfortable, and stop the treats when you stop handling their paws. If they already like being on their back, this is the best position to be able to trim their nails in and a great time to train them to be comfortable with having their paws handled. However some adult cats already don’t like being on their backs and will have a hard time with it, so you’ll have to find an alternative position where they’re comfortable. For adult cats that are already afraid of nail trimmers, help improve their association by pulling out the nail trimmers during happier times such as feeding and petting. Don’t use them at these times, but just place them nearby so that they become familiar with their form and reduce their negative association with them. When do you trim a cat’s nails, start with just one at a time and then give them a treat. While they’re eating, cut the next nail if you can. It helps at this point to have an assistant providing your cat the treats. Especially at first, don’t trim more than five at a time. This helps reduce the stress buildup from reaching the point where your cat will want to run away. If your cat really really can’t stand it, you can gently wrap them in a towel and trim one foot at a time. Even with this method it’s best not to go for all four paws at once. If they’re angry or stressed that will build up their negative association with trimmers and make every attempt difficult and unpleasant. However if used gently, the towel method can be a helpful training tool in the beginning for particularly skittish kitties. Make sure you’re not trimming their nails too far! You only want to clip off the sharp clear end, avoiding the pink quick inside which is sensitive. This is why it’s helpful to have an assistant, your cat comfortable so they’re not pulling away, and especially to have trimers that are sharp and easy for you to handle and see the nail while using. We wish you luck with helping your cat become comfortable getting their nails trimmed! If you have any other tips or tricks, feel free to let us know! And if you’re on the lookout for a new feline best friend, check out some of our favorite cat rescues on our Community Partners page. Its no secret that our dog pals love to eat. Not only do they want a piece of their food, but they typically want a piece of our food as well! With those adorable faces staring right at you, it can be hard to say no. But it is so important to know if the scraps you feed your furry friend are actually safe for them. Most of us know the basics; no corn cobs, chocolate or grapes. But after doing a little more digging, there were some foods I found to be a surprise on the do-not-feed list. Some of them may seem obvious, some less so. It’s never a bad idea to brush up on these DONT’S. It can be all too easy to slip our mind and give our pets a piece of our left overs. Bacon- I’m sure we have many guilty dog parents who wanted to give their pal their first piece of bacon. I’ve found from multiple sources that bacon can lead to serious digestive issues or if given too much can cause pancreatitis, which can be very dangerous for our four legged friends! Peanut Butter- Not that this is a complete no no. However, I wanted to shine a light on the fact to make sure the peanut butter does not contain the artificial sweetener xylitol, which is an ingredient deadly to dogs. Added salt content is also bad for their cardiovascular health. Peanut Butter is a lifesaver when it comes to getting stubborn doggos to take their medication, so just make sure it’s free from salt and especially xylitol. Adam’s 100% Natural Peanut Butter is a delicious and easily available brand that carries a plain Peanut Butter safe for dogs. Raw Eggs- I’m sure there are plenty of people who like to crack open an egg and pour it over dog food to make it more appealing, however this cause a high risk of catching salmonella and e. coli infections, and a dogs system can have a hard time battling that off. Raw Potatoes- Green Potato Poisoning happens when dogs eat too much solanine, a compound found in raw potatoes, tomatoes, and eggplants. The symptoms include heart problems, breathing difficulty, and digestive issues. Dairy- Pouring some milk in the dog bowl or sharing your ice cream cone may sound like a good idea, but dogs stomachs can not process diary the same way we do, so it can end up leading to a lot of uncomfortable stomach issues if consumed too often. Watch the yogurt servings too, some dogs can be sensitive to it! Honorable mentions: Cherry pits, mushrooms, garlic/onions, apricot pit, avocado pits. Now let’s focus on some of the healthy human foods we CAN feed our four legged friends! Apples- Is a great source of vitamin A & C as well as an excellent fiber source. Just make sure to remove the seeds, which can be not so great for dogs to digest! Blueberries- Are an excellent source of antioxidants for dogs, and make good treats for tossing in the air for them to catch. Brussels Sprouts- Are loaded with great nutrients for dogs, just don’t give them too much or they may get gassy. Carrots- Are a great low calorie snack, and great for strong healthy teeth. Celery- Is a great healthy snack loaded with vitamins. Cucumber- Is a great treat for overweight dogs , and can even help boost energy levels. I hope this list shines a light on some of the delicious human foods you keep in your kitchen, and just remember; our stomach and their stomach don’t process foods the same way. A lot of these can vary on the breed, size, and age of your dog, and you could be doing a lot more harm then good for their digestive system.